If you haven't heard Barbra Streisand sing Soon It's Gonna Rain, Much More and Happy Days, part of your soul has not yet been born. If there is such a thing, and there isn't, she is too much. 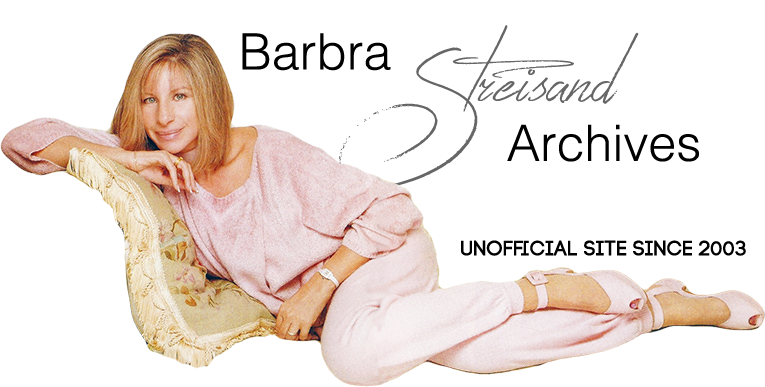 In 12 months Barbra Streisand has rocketed to a dazzling fame the cause of which no critic has yet named and so still remains a simple secret. That secret is: she goes all of the way, all of the time. Many twenty-one year olds have excellent voices, more are not pretty. What makes Barbra Streisand unique is that she transforms the second and catalyzes the first with a self-ingrained, 100% love of life. lf there is one, and there isn't, an after-life would be a pretty puny thing next to the real one this girlwoman sonorously screams of to us, first bending, then gasping, now shuddering with the rapture of a song too much even for her. 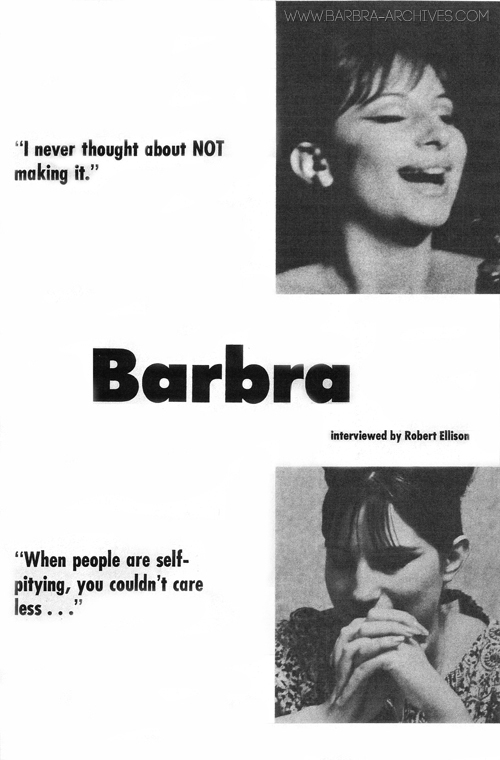 On these ten pages, Barbra Streisand reveals fully the content and style of her mind. On these ten pages, Barbra Streisand shows flaws. Like many Originals, the way she lives is unique and powerful and exalting, but when asked to explicitly verbalize it, she occasionally pays lip service to the near opposite of what makes her tick, and may even become inarticulate as her songs and life are stunningly articulate. But when asked to speak of what she lives, what she knows first hand, Barbra Streisand displays a rare wisdom, if she ever changes what gives birth to that wisdom, if she ever sells out one iota of her self-righteous love of life and her vow, implicit in each song she sings, to fight for every moment of happiness she can squeeze into that life, the apostles of sin and suffering will have won an important victory. The only kind of victory, in fact, which they can ever really achieve. Digest: Why did you leave home after high school? Streisand: l didn't like traveling on subways to New York from Brooklyn. D: Did you work as a secretary before you broke into show biz? D: How long did that last? D: Have you taken voice lessons? D: Who selects your tunes for the albums and the shows? D: Everything is your own idea? S: Few things are that cut and dried. A lot of people recommend songs, but who decides if l should do them? Me! D: Who suggested that Happy Days be done in that deliberate, superexalted style, with that deliberate, superexalted arrangement? S: l did on the Garry Moore show. For the year 1929. And it just came out nice and slow. D: How do you like being compared to Judy Garland, Lena Horne, Billie Holliday, Ethel Merman? S: l hate being compared! Period! D: Some people feel that, though some of your songs are downbeat, you are a very positive person. True? S: Yeah, l do have hope. And that seems to come out. D: ls that what you're selling? S: l don’t know what l’m selling. Candy? D: Is the Enrico Banducci [Note: Owner of The hungry i] story true? The San Francisco Chronicle quotes you as saying: "'You night club owners are all alike,’ she declaimed witheringly. 'You’re going to be down on your scabby knees, BEGGING me for a contract before the year is out, idiot.'" D: Did you say this dead-pan? S: l was serious. And it worked. Twenty minutes later we signed a contract. He's the only one that would have done that, though. Everybody else would have thought I was nuts. But he’s such a nut. He’s a delightful guy. I love ’im. D: Someone told me that your interpretation of Cry Me a River shows your indomitable quality, that you obviously have the strength, the guts to overcome any sadness. Agree? S: Who is this guy‘? I'd like to meet him. He's very perceptive. l like him. lt’s true. You know, there’s more emotion in hope than there is in just emotion. S: In other words, it's more moving when you see, let's say a crippled person, making life good. lt’s more than if he is simply bitter. You know what I mean? S: Well, that’s the way I feel about it in terms of the truth of situations. Things are always more meaningful when you see somebody trying to overcome it. In other words, a great person who is going to die but being happy — it's a tear-jerker. That’s why they always have it that way in the movies. You know when you cry at a movie it's because of that. Because they get to what really affects people. Not just tragedy or obstacles in themselves — then you couldn't care less. When people are self-pitying, you couldn't care less, even if they were the worst people in the worst possible shape. D: You say you feel it's more meaningful when a cripple is trying to overcome it rather than one who simply submits to it. S: l’m not saying that l don’t give ‘em any pity. But it is much more touching when somebody tries to overcome his own handicaps. When somebody has just gone through a very trying ordeal, and they go out acting as if nothing’s really happened — that’s when it's so touching, and beautiful. Not when they go out and say, 'My God, what happened to me?'" S: Right! What the truth of it is is going against it. D: Where’d you get the spelling of Barbra? D: B-A-R-B-A-R-A is the real name, but you dropped one letter? S: l hated the name, but I refused to change it. S: Because it would be like changing my nose, or changing something that’s me. lt would be fake. D: Like Tony Bennett. He wouldn’t change his nose either. S: He’s afraid of the pain. So am I. D: I read somewhere that your black wool gown once was a blanket. True, or merely publicity puff? S (incredulously): Once was a blanket! D: That's what one of the New York papers said. S: l have other dresses that were blankets once, but not the black wool one. D: Do you pick your own gowns? S: Nobody could pick anything l have. I do everything myself. l must! Because if it's wrong, then l have myself to blame. l could never rely on anybody else. My judgments on myself are too strong. You know what I mean? lt’s amazing how you read about people, that this one or that one molds them. It's like l can't quite believe it, yet I can. D: lsn’t Mr. Kenneth doing your hair now? S: Mr. Kenneth? Twice, two times. l mean you go to a hairdresser, and you say, 'l want hair done like this,' and he does it. What's the big deal? D: Do you ask him to suggest how it should be done, or do you tell him the way you want it? S: I'm always open to suggestions, but l change it afterwards anyway if l don't like it. D: President Kennedy, after seeing you on TV, recommended that you be added to the entertainment at the White House Correspondent's Press Dinner last May 24. Your agent told you, so the papers said, that you should send Caroline a gift. S: Ahh, that's so much crap. I don't know where that came from. Send Caroline a gift? She should send me a gift! l’ll make a deal with her. l’m not unreasonable. Is that what it said in the paper? S: That's unfunny. And l would never say it. l’d send her an Elizabeth Taylor doll, or something. S: You know it’s like — I don’t believe things. That’s why your tape recorder is marvelous. And from now on every time l have an interview l’m going to bring my own tape recorder. True! So that I can sue. lt’s incredible, because every word that he said l said, I said. But not in that order! Do you know what I mean? And it’s the difference between making sense and making nonsense. S: Why don’t we call him up, and ask him what he means. I mean it's . . . I swear, no more interviews without a tape recorder. The more I see of this, it’s incredible. Wouldn't it be great if I turn on the tape recorder and l ﬁnd I did say that. I’d shoot myself. (mock horror) I couldn't have done that. In terms of me, in terms of my intellect, l don’t use my intellect until afterwards. In other words, l’ll do something — oh, and that came out that way, and then l’ll intellectualize after. S: Yeah. And that always seems to be the best way. That's what I meant, probably, in terms of these words that he said. D: This thing about creativity being a part of perversion, that women should be content to be housewives, etc. Don‘t the lyrics of Much More contradict that? D: Then women need much more than motherhood? S: Well, l do. (cutely) But I’m perverted, obviously. D: Let's discuss your marriage, okay? D: Once again, then, the man from Luce: "l don't want to cut off the emotion, because l just know the sensory things. l deal in the senses! Know what l mean?" S: You don't? l don't think l should explain it to you it you don’t. D: l think l do. But l’d like proof. S: What is your existence? l mean you only know, really, l only do, from things. l mean, tangible things. In other words, we can have opinions, or discuss theatre, and that's all intangible. But what l do know is foods l like, mattresses l like to sleep on, clothes l like to wear, things l like to smell, and things l like touch, which are the senses. And these are the only tangible things, that l know about. The others are all based on them. D: What about friendship, ‘things’ like this? S: Well, they’re all strange. l’m talking about real, just basic things, which all others are based upon. S: Yeah. But that's what l am. Aren't you? D: What did David Merrick say? S (amiably, with a lilt): Helll-o-o-o. l never saw him. You see the stage manager. He’s a nice guy, Merrick. l like him. D: How about here at Kelly's in Chicago? You haven't been late at all? S: No. l’m using discipline. It's a form of maturing, you know? A form of the responsibility of being more famous. But l’ve been using my will to overcome that (she chuckles). I'm a Torion, you know. See, we’re very strong willed. D: Do you actually follow astrology? S: Only when it suits me. B: Is it true that you read Mad magazine? S (enthusiastically, like a kid who had just been asked if she wants a lollipop): S-u-u-re. S-u-u-re. Did you ever read it? They send me three copies now. They're very sweet, cuz they know where l am, ever since I mentioned them in the New Yorker. l mentioned a lot of things in the New Yorker, and never saw them. D: Why did you tell Lee Strasberg that your favorite actress was Rita Hayworth? S: l was being cute. l don’t think he liked it. I really didn’t mean it. l was trying to prove a point. l don't think he went along with it. l’d like to go there someday, the Actor’s Studio. l don't think he'd let me in now. D: Is that what you ultimately want to be, an actress? S: That’s what l am. D: What do you ultimately want to do? Movies, theatre? S: l never think in ultimatums. When it's summer, l’d like to be in the East. And when it's winter, l’ll do a movie in California, go where the sun is, you know. D: You're sure it wasn't Scotty Reston? S: No. Who’s that? But it wasn't Earl Wilson. D: Who’s your favorite singer, male and female? S: I don't listen to singers much. I mean I just don't have the time, number one. Two, I only got a Victrola about three years ago. Because l never had records. l got a lot of my material from listening to old-old singers, the old tapes, the old things. My songs go back, a lot of ‘em, many years. S: Lee Wiley, Ethel Waters, Ruth Etting, Helen Morgan. l like the sound system better then, too. l do. The clinky violins, you know, and the sound of the horn, and the megaphone. There was much more style. D: How about telling us a little bit about your childhood? S: l don't remember it. l was born at six. Came out with a full set of teeth. D: When you sing Happy Days in night clubs, you end it differently than you did on the record. Why? The climax on the record is unique. S: l like it better in the clubs. So l don't do the other way anymore. D: You mean you don‘t like your cut? Why? S: lt‘s too emotional. This was a thing l did at the moment. In other words, I said l wanted a strong ending, but it was too strong, if that’s possible, except l thought it was terriﬁc at the moment. But after hearing it again, it's not right. D: What is not right with it? S: lt should be more understated. D: How did you happen to pick a tune like Who's Afraid of The Big Bad Wolf? S: My friend, Barry suggested it. We were kidding around, because it was my first engagement at the Bon Soir. It's a sophisticated, posh little nightclub. That annoys me, anything that's supposed to be posh and sophisticated, you know. So l wanted to do something that was completely — wrong! And so it was like me talking about I would love to do a nursery rhyme or something, and Big Bad Wolf was Barry's suggestion, and l looked at the lyrics. And it’s just worked great. I used to close my act with that. I had six songs at the Bon Soir, and that was the last one. D: Are you still using your Santa Claus number? S: "You better not pout, you better not cry, you better not shout, I'm telling you why — Santa Claus is dead"? (In a little girl's voice) I don’t like that anymore. S: I don’t wanna think he’s dead. D: Have you learned anything from listening to the records of, say, Sinatra? S (emphatically): I don't learn from nothin’, except myself. D: I didn’t say imitate, or copy; I said learn. S: I never saw ‘im. I can’t learn from a record. Actually, it’s true that I have learned from watching performers — what not to do! D: How about telling us something about your childhood? Any problems in school? Win any talent shows, any awards? S: Yeah, I was very smart. D: What kind of grades did you get? S: 90’s, all 90’s. But it was really weird because you see, l was . . . I was very smart. Right? But l dressed weird, dressed crazy, and had bleached blonde hair. I used to dress strange, I guess, in terms of the norm. D: You mean wearing the black leotard? S: That was after. No, I just used to wear gingham, with lace. And I don’t look the type, you know? I bleached my hair blonde when I was about 13, and then tried to get it back, and so l put a rinse on, not knowing that you can't do it with a rinse. And then my hair turned blue and green, and maroon. And l would never have it dyed. You see, I could never stand the idea of having dyed hair. So I walked around with green hair a long time. And, I was smart, and I would have lunch with these — I wouldn’t know who to talk to. Because the smart kids wearing oxfords and glasses wouldn’t look at me, and the dumb kids l wouldn't want to associate with. So I was a real outsider. Until I found another one. I had one friend, and I still have this one girl friend. Her name is Susan. She used to wear pasty-white makeup. Pasty-face, I used to call her. And she looked like a steeple-chase when she smiled. And she used to wear spaghetti shoes and black stockings, and had a pixie black haircut, and nobody had them then. So we gravitated towards each other. D: Sounds like an early Gittel. S: We were both pretty weird. D: Why did you dress that way? S (enthusiastically): l liked it! l never thought about it, l thought everybody else looked terrible. D: How about the first couple of years in Manhattan. Did you dress the same way? S: Yeah. l can't stand the cold. Like the ﬁrst thing l bought with my money was a fur coat. Not mink. l hate mink. l have a great fur coat, though. But l cannot stand to be cold. And l’ll do anything to be warm. l used to wear, ah, thick stockings, or these tights, to be warm. And when l’d go to offices and appointments l used to wear them, too. And that wasn’t understood. You know, you have to wear hose and high heels when you go to appointments. But l’m more interested in being warm. So l was always sort of looked at funny, I guess. l’m gonna still wear the tights, only now they won’t laugh at me anymore. (triumphantly): Now they’re gonna wear the tights, too! They’ re wising up. Be warm, schmoes! Be warm! D: How about your ﬁrst couple of years in New York? Did you study nights? S: l used to go to acting school. l never did singing. S: No, l studied with Alan Miller. l’ve a scholarship there. D: Think it did you much good? S: Shhh . . . Damn right! D: But no voice lessons at all? D: Did you always have the feeling that you were going to be a star? S: Yeah. Since l read this book on Dali. I was about three-years-old. D: Did you set yourself a deadline to make it? D: Some people set a deadline, and if they don't make it by then, they figure they'll go into another profession. S (amazed): Are you kidding? l had not choice. l mean it would be ridiculous. lt was just inevitable. lt sounds terrible. l never thought about NOT making it. Oh, l just had to have those nice furs, and emeralds. S (laughing): Right. They used to look at me, make my eyes light up. D: You said earlier that you wouldn’t have your nose changed, that you had to be yourself, etc. Do you think that the sensationally upbeat ending on Happy Days, on the record, is bad because it's not you? S: It's too much me. You've got to have a little restraint, which wasn’t there, that's all. lt's all right, though. Just shut it off before it comes to the end. D: Do you think that your greatest strength is in being seen in clubs, on stage, etc.? D: Are you surprised then about the success of the record? S: Uh-huh. In terms of commerciality of the songs, they said, "ah-ah,” and nobody thought it would ever come off because they‘re weird songs, nothing people could hum with. Most of these songs are ad-lib. You can’t even dance to them. You’ve gotta listen. But afterward, it thrilled me to succeed because l knew anything that is right and that is good — anything that l like! — should be accepted. And it's beautiful. It's not really weird or anything. It's beautiful. Soon lt’s Gonna Rain is a beautiful song. But they say, "Nah! The public is stupid." l don’t think the public is stupid. The public knows more than they do. People all feel the same things. We're all human. Therefore, anything that is real, must be understood. D: Barbra, that's about it, tapewise. Is there anything you’d like to add? 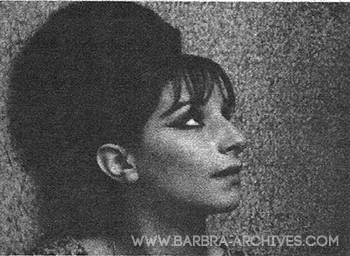 * New York columnist Earl Wilson supposedly stopped Barbra at the stage door, and she told him to quit following her around. "You're a stage-door Johnny," she allegedly shouted.